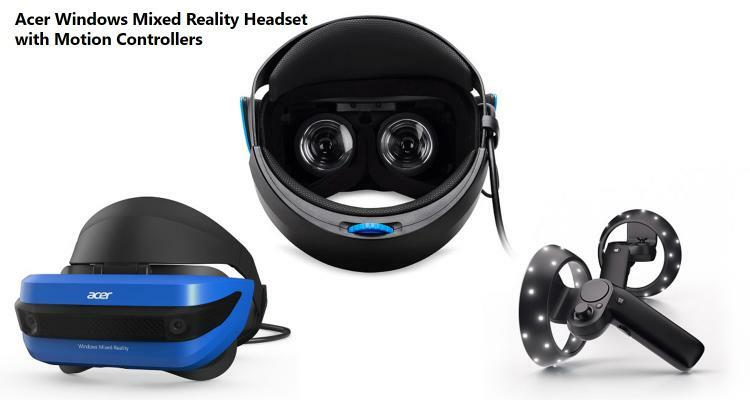 Acer’s Windows Mixed Reality Headset is a lightweight head-mounted display system that comes with two wireless motion controllers used for virtual applications. Known as “mixed reality” this headgear allows users to interact with others in the physical realm as well as a virtual dimension at the same time. With the Acer Windows Mixed Reality headset and wireless motion controllers, venture into Windows Mixed Reality and setup your own virtual home and enjoy content such as sports, travel, culture, live sports, and games. There are more than 20,000 available games that support Windows Mixed Reality such as Minecraft and more. Enjoy films in a virtual cinema with Spatial audio that allows you to hear sounds just like in the real world. Windows Mixed Reality is easy to setup where you can go in within 10 minutes. It remembers the virtual spaces you’ve been so resuming your adventure can be done in a jiffy. Enjoy crisp realistic movement, immersive visuals, and spatial audio. Motion controllers feature haptic feedback, thumbsticks and button control, so you can easily navigate around every game. The Acer Windows Mixed Reality Headset and Wireless Controller Bundle is up to pre-order at the Microsoft Webstore with an MSRP of $399.99/£399.99 including VAT. The headset and controller bundle is set to be released this October 17, 2017.